"With padded sidewalls, convenient organization and a substantial suspension for backpack-style carry that disappears when checking bags, the Porter Series has set the standard for deluxe duffels. This season brings a relocated and dedicated zippered laptop and tablet pocket�and functional storage options for items both big and small�with multiple access points. 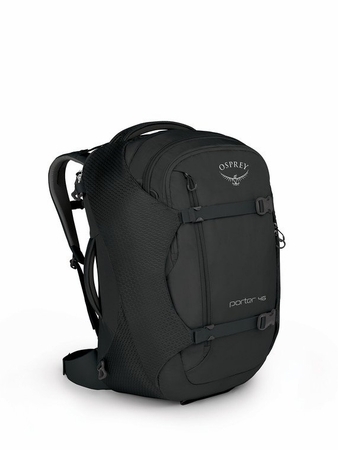 When a duffel isn�t enough and backpacking bags are too much, the Porter is the answer. StraightJacket� Protection- StraightJacket� compression straps with padded sidewalls to help protect your bag's contents and allow you to fit more gear or compress the bag to a smaller size when it isn't fully stuffed. Stowaway Harness and Hipbelt- The Porter harness and hipbelt deploy at a moment's notice for backpack style carry and quickly disappear into the backpanel for safe keeping when your bags are checked. Organized and Accessible- Structural sidewalls hold your bag open, making it easy to pack and unload, especially with the massive U-zip opening. Dedicated, easily accessible pockets provide on-the-go access to key items. Traveling is about experience and memories, and you'll have more time for both when you spend less time packing. O/S - 2807 in3 / 46 l - 22h x 14w x 11d in. - 3.4 lbs."